Are you hiring a new maid? Do you want to know how to manage and train a maid? 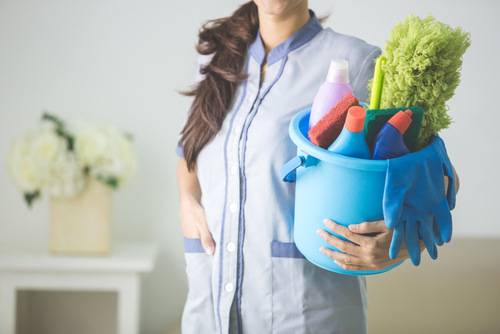 In Singapore, you will find many homes where people find it difficult to manage the maid and the process becomes more complicated when they need to manage a maid from a different culture. But you can make the process easy with some simple principles and guidelines. Keep one thing always in mind. If you treat them in a respectable manner then they can try to prove themselves as a better worker and can feel committed towards your family and their job. Regardless of her background and social status, you just need to treat her with respect and care to develop a healthy and friendly relationship. You should try to maintain a good understanding with your maid and should give her enough opportunity to prove her ability and to win your trust. It is not that difficult to hire a maid, but it is hard to get a reliable and committed maid. Hence, make sure that you have hired the maid after a proper research. The next thing is that you should try to train her slowly without trying to teach everything at a time. Moreover, try to think from her point of view and give her some freedom to keep her points. You should not always try to change the maids. If you change them more frequently, then it will create a bad impression. And you will have to spend more time, energy, and money in the entire process. Another thing is that you will have to do the same effort to teach them the basics. Hence, instead of trying to change them, you should try to train them in the right way. The training process might take time, but it will be helpful and effective for the long run. Are you having difficulty to manage your maid? Do you want to give her some training? Do you want to make her familiar with your family members? If yes, then go through this article. In this article, you will get some tips on how to train your maid properly. A maid is a new addition to your family. It is equally difficult for her to manage in such an unknown environment where everyone expects perfect and timely work from her. In the initial days, she needs your support and your help to understand her responsibilities. You just need to tell her what you expect from her, which thing cannot be ignored, and what are the preferences. Do not try to dominate her. This is not the right approach. Try to be friendly and make the training process continual, simple, and easy. Remember that everyone likes a dignified life. You should treat the maid with respect. If you are a working woman, you can understand her mental condition in a better way. Instead of abusing of for her mistakes, just try to teach her how to do this job properly. If she is new and does not have enough experience, then you might need to take extra effort to train her about your family and their demands. If you have younger kids at your home, then make everything clear. You just need to teach her how to manage your kids and family in your absence. And more importantly, if someone requires extra attention then give special instruction to attend that person at the right time. Teach her about the efficiency and value of work. Everyone likes appreciation. If you appreciate your maid for her work, better management, and for every little thing where she shows her efficiency, then she will be inspired to work with more dedication. In addition to the appreciation, you can buy her small gifts. That will matter a lot. A newly appointed maid knows nothing about you and your family. You might give her some instruction about her job. But that will not be enough. You will have to guide her in almost every work for a couple of weeks or until she is not acquainted with your family environment. She might have come from a different surrounding. And your guidance can help you to understand the things easily. Your maid needs a healthy life. You should give her enough food and rest to keep her healthy and energetic. Make sure that she is getting seven to eight hours sleep every day and foods in regular intervals so that she can perform her job efficiently and sincerely. You should not depend on your maid for every little thing. This will only create problems for you. Instead of depending on her for all the household chores, you should do something on your own. You should take care of your family members in your free time and should spend some quality time with your kids. You can spend some time in the kitchen on the weekends as well. You should not try to hurt or dominate your maid. But at the same time, you should not allow her to dominate you. Always maintain a healthy and respectful relationship. If you find that she is trying to dominate you then tell her straight away so that she will not repeat that mistake. Though your maid lives with your family, but you should not discuss your family matters in front of her. She is not your family member and she should not interfere in your personal life. Moreover, if she is a new maid, you should take some time to understand her behavior and preferences.A maid can be reliable and sincere with a proper understanding. Instead of abusing her for her mistakes, you should try to teach her responsibilities in a respectful manner. Hence, it is important to train her properly without trying to change her for small things.